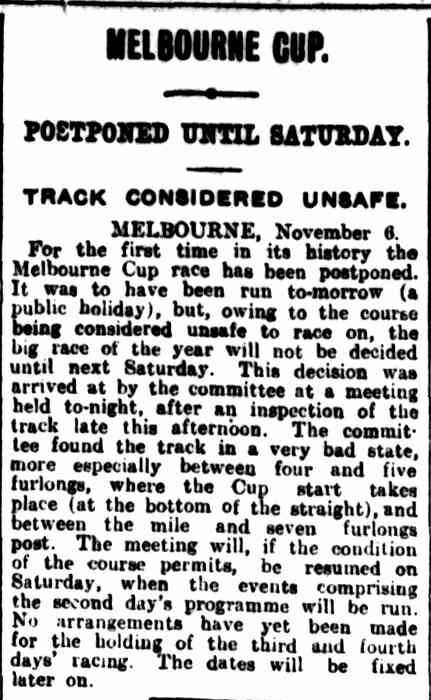 The postponement of the 1916 Melbourne Cup due to days of heavy rain that deteriorated the state of the track upset the plans of racegoers taking advantage of a public holiday to attend the great race. “MELBOURNE CUP.” The Brisbane Courier (Qld. : 1864 – 1933) 7 Nov 1916: <http://nla.gov.au/nla.news-article20106876&gt;. But it was the caterers who suffered the most having prepared much of their food in the days prior. 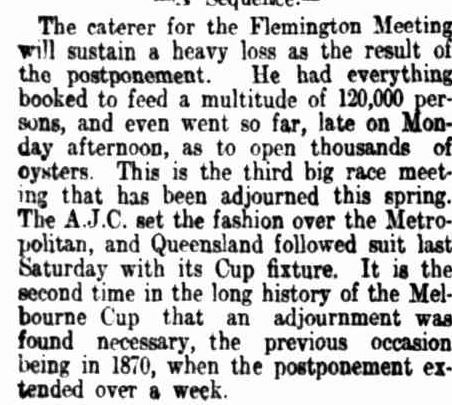 “POSTPONEMENT OF MELBOURNE CUP.” Hamilton Spectator (Vic. : 1914 – 1918) 8 Nov 1916 <http://nla.gov.au/nla.news-article129389399&gt;. “THE POSTPONED CUP.” The Register (Adelaide, SA : 1901 – 1929) 8 Nov 1916 <http://nla.gov.au/nla.news-article59904012&gt;. 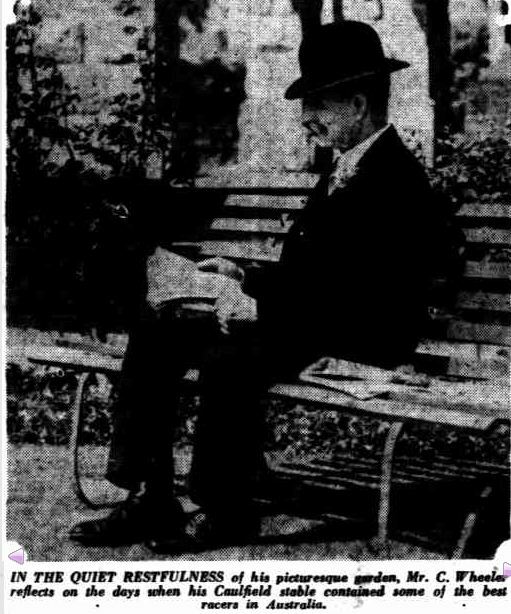 The first article, from The Brisbane Courier, stated the 1916 postponement was the first in the Cup’s history. But it wasn’t as in 1870 the race was postponed, again due to rain. “No Title.” The Bacchus Marsh Express (Vic. : 1866 – 1918) 29 Oct 1870 <http://nla.gov.au/nla.news-article89700967&gt;. 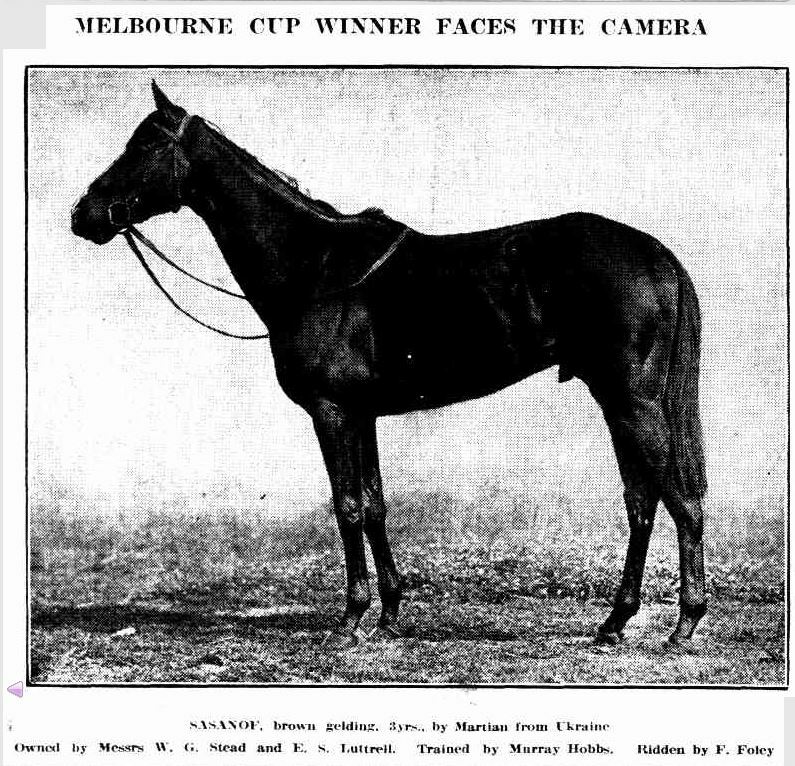 The 1916 Melbourne Cup was eventually run on Saturday November 11 and the winner was Sasanof. “MELBOURNE CUP WINNER FACES THE CAMERA.” Winner (Melbourne, Vic. : 1914 – 1917) 15 Nov 1916: <http://nla.gov.au/nla.news-article154552058&gt;. It’s Melbourne Cup time again and I love that it falls on Trove Tuesday. There are many ways to pick a winner and around Melbourne Cup time, you hear them all. Some go for numbers, the name, the colours or maybe an omen. 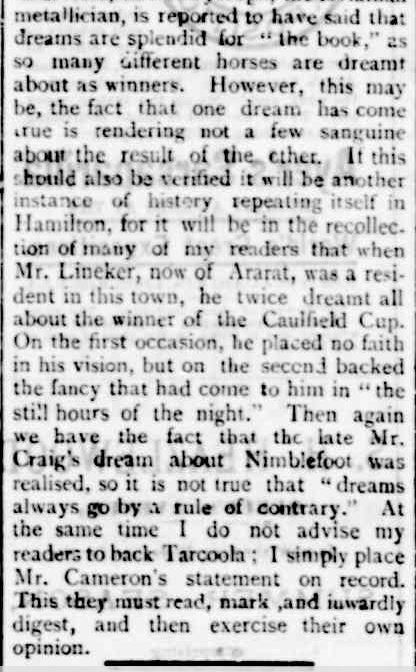 Often after the event, punters will claim they dreamt up the winner, and as the “Sound” from the Hamilton Spectator suggested in 1894, they are often not game to declare their selection prior to the race. But not so John Cameron. 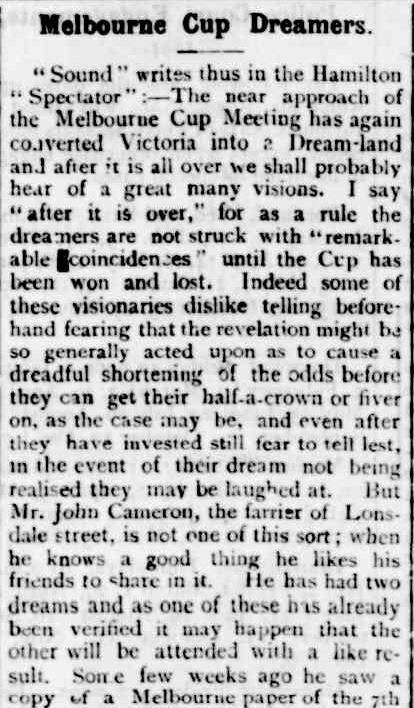 Back in 1894, farrier John Cameron of Lonsdale Street, Hamilton, claimed his Melbourne Cup selection came from a dream and he was happy to share his vision. The 1893 Melbourne Cup winner was Tarcoola and it was that horse’s name that came to Cameron in his slumber. 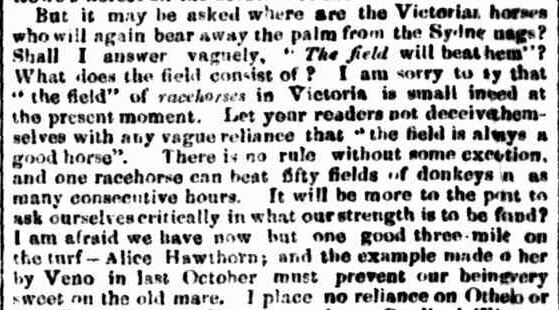 He recalled seeing a newspaper listing previous Melbourne Cup winners including Archer for 1861/62 and Tarcoola 1893/94. 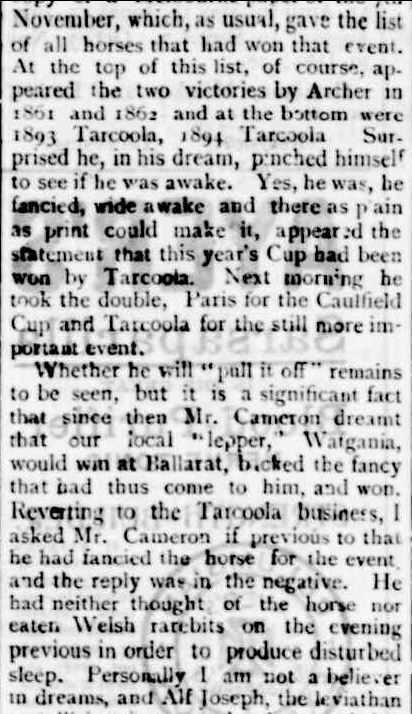 So convinced that he had dreamt the winner, he took a Caulfield Cup/Melbourne Cup Double, Paris into Tarcoola. The “Sound” recounts the most famous prediction emanating from a dream, the winner of the 1870 Melbourne Cup. 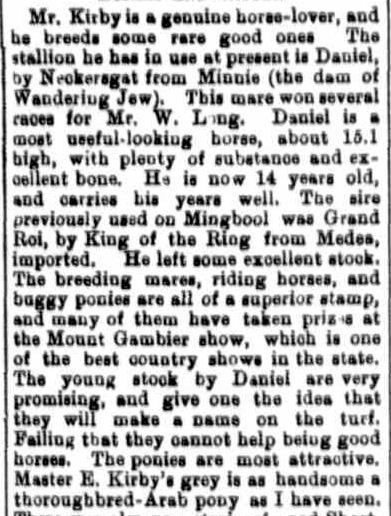 The winner Nimblefoot, the dreamer his owner Walter Craig, owner of Craig’s Hotel, Ballarat. Are you wondering if John Cameron was a winner? The first leg of his double come in, Paris in the Caulfield Cup. 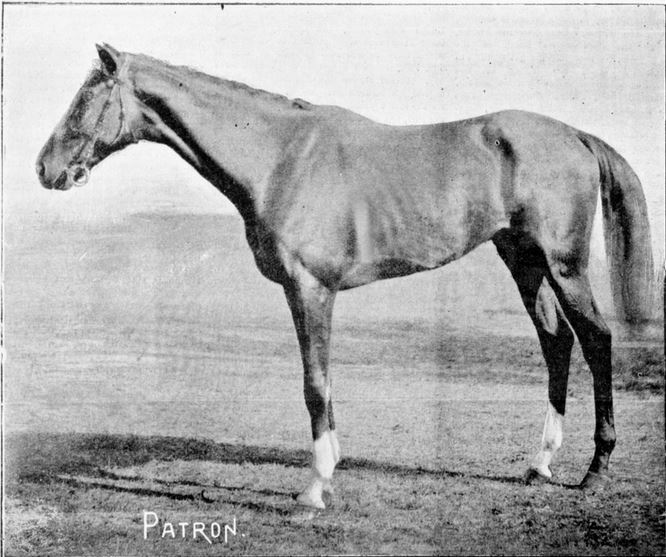 The Melbourne Cup winner was Patron, with Tarcoola unplaced. 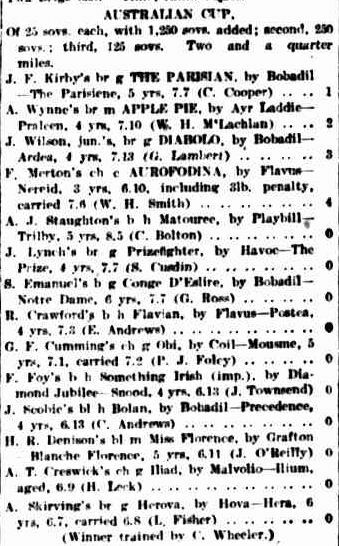 In 1941, a horse with links to the Western District won the Victoria Derby/Melbourne Cup double. 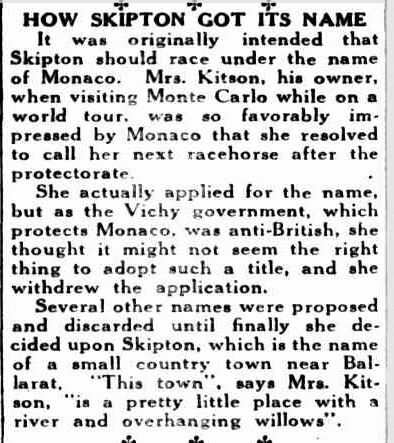 Named after a small town west of Ballarat and with a female owner from Hamilton, Skipton had the two towns on their feet when he crossed the line to win the 1941 Melbourne Cup. Myrtle was superstitious, and on the day of the Derby of 1941, she remained in Hamilton tending the Grand Central Hotel, where she and her husband John were licensees. John and daughter Morva represented her at the races and when Skipton crossed the line as the winner of the Derby, they accepted the trophy on Myrtle’s behalf. After the race, reports came through that Skipton had pulled up sore and was an uncertain starter in the Melbourne Cup the following Tuesday. 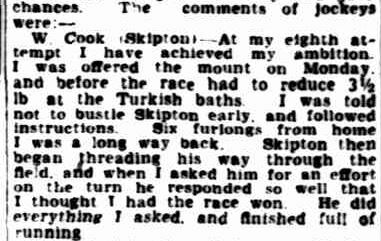 The night before the Cup, Skipton was declared a starter with William Cooke (Billy) to take the mount. The late decision, although probably tactics, was the correct one as Skipton took out the race. 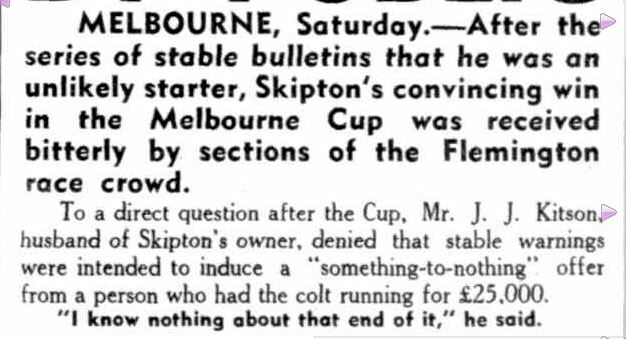 In doing so, Skipton achieved a feat only twelve horses had done before and no horse has done since, winning the Victoria Derby/Melbourne Cup double in the same year. Like Derby Day, Myrtle not wanting to jinx the horse remained at the Grand Central Hotel on Cup Day. Morva and John stopped at Skipton for a cup of tea on the way to Melbourne, just as they did three days before…just in case it was an omen. As Skipton crossed the line, Myrtle declared “Turn it on for the customers”. 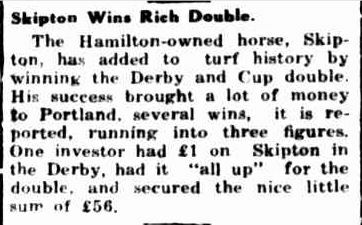 It was not just the money of Hamiltonians riding on Skipton’s back that day. The Portland Guardian reported there were big wins in Portland on bets placed on the “local” horse. 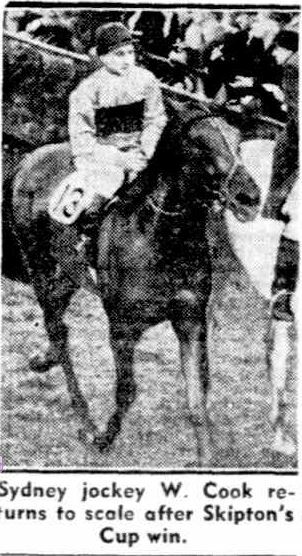 The win gave Billy Cook his first Melbourne Cup, in his eighth attempt, aged thirty-one. He won the Cup again in 1945, aboard Rainbird, a horse bred in the Western District at Cavendish. By the end of his career, Cook had won almost every major race in Australia and had received legend status. He was inducted into Racing’s Hall of Fame in 2002. The win was not without controversy. Punters were angry because in the lead up it was suggested Skipton was unlikely to run. The price went out and rumours of a £25,000 bet were spreading. John Kitson denied the rumours insisting he only bet £8000, still a handsome wager in those days. 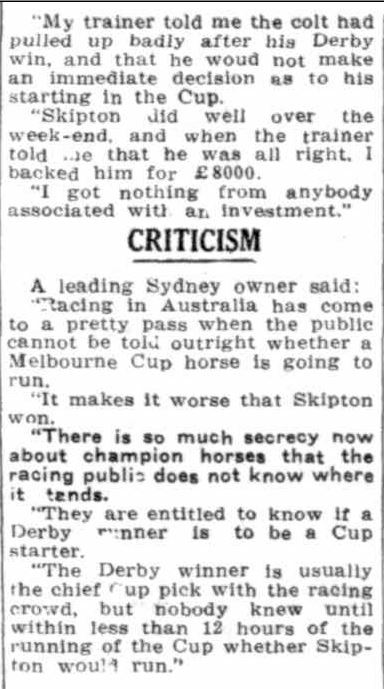 A Sydney owner was quick to criticise the secrecy surrounding champion racehorses. 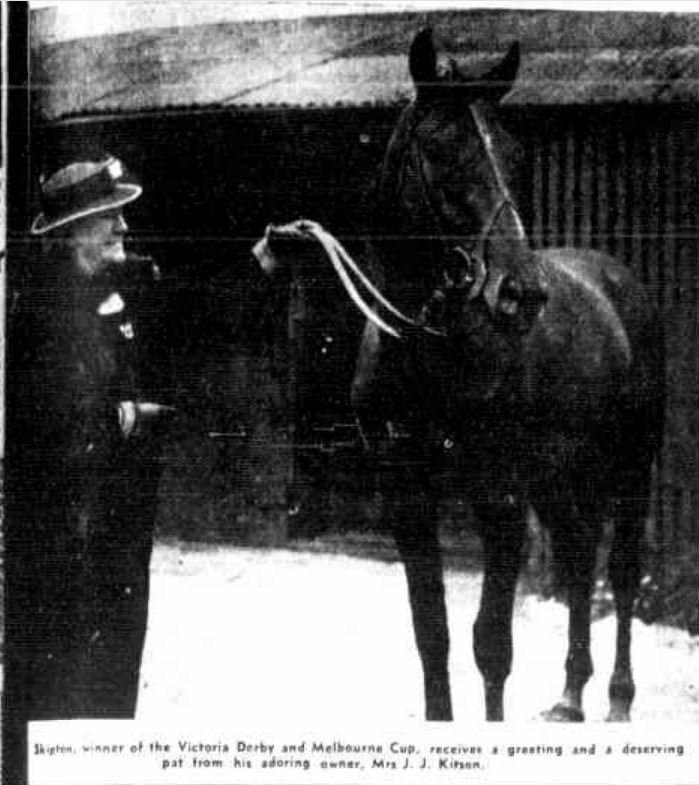 Myrtle was soon reunited with the horse who put her in the history books as the second only winning female owner of the Victoria Derby and the third winning female owner to of the Melbourne Cup. “Melbourne Jockeys Turned Down Ride on Cup Winner” Sporting Globe (Melbourne, Vic. : 1922 – 1954) 12 November 1941: 1 (Edition2). Web. 20 May 2018 <http://nla.gov.au/nla.news-article181717280&gt;. Back in Hamilton, the town was riding on the back of the Kitson’s success. A “local” horse had won the cup. 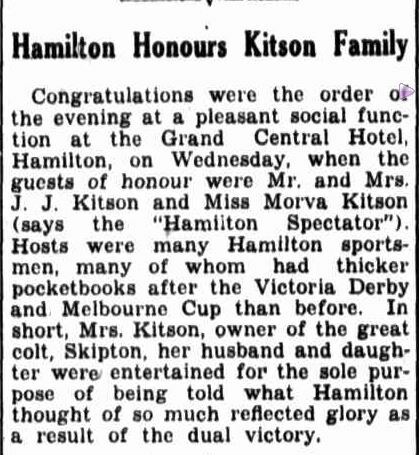 To congratulate the Kitsons, a dinner was held, at the Kitsons’ own hotel. The following year Skipton did not start his preparation well, with a disappointing run in the Mentone Cup. He followed up with a win in the Stand Handicap, pushing him into Caulfield Cup favouritism. However, he could only manage fifth in the race, with Tranquil Star narrowly winning from Heart’s Desire. Along with the Caulfield Cup, Tranquil Star won the Caulfield Stakes, WS Cox Plate and the McKinnon Stakes in the same season. 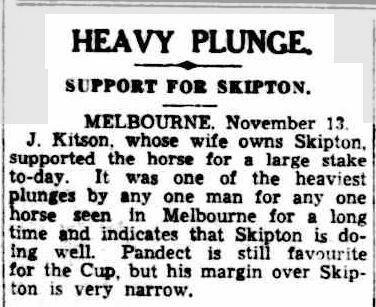 Despite the defeat at Caulfield, come Melbourne Cup time Skipton was pushing for favouritism after John Kitson placed a rather healthy wager on Skipton, thus giving a hint that the horse was on target. The task was ahead of Skipton. No horse since Archer in 1861/2 had won consecutive cups and the only horse to have won carrying more than nine stone in the ten years before was the champion, Peter Pan. 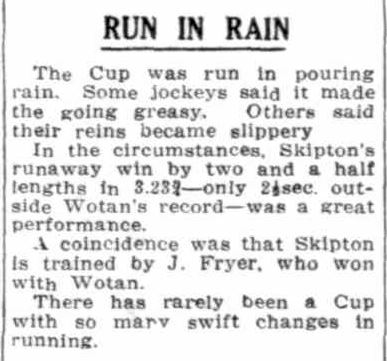 Punters were willing to stick with Skipton especially after his excellent lead-up win in the Hotham Handicap carrying 9st 4lb, and as they say, records are made to be broken. The records remained intact. In what has become known as the Austerity Melbourne Cup, due to WW2 belt-tightening, a rank outsider called Colonus got up by seven lengths in heavy conditions. Skipton spent the entire race near the tail of the field. He was then sent out for a spell before his next tilt at the Cup in 1943. 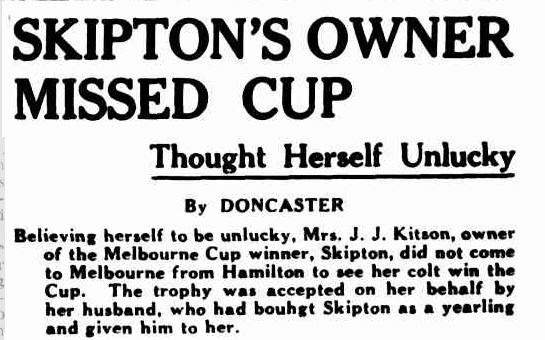 Skipton returned in the Spring of 1943 with the Caulfield Cup his first goal. That year, because of an overwhelming number of nominations, there were two divisions of the Caulfield Cup. The first division was won by a roughie Saint Warden and Skipton, showing some of the class of his three old days, won the second division, Naturally, Melbourne Cup favouritism ensued. 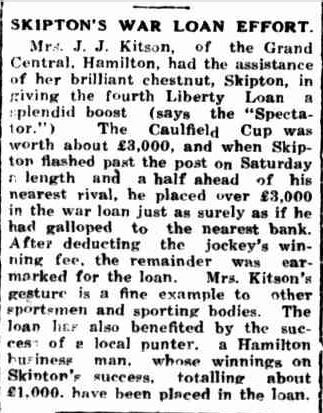 After the win, Myrtle and a generous Hamilton punter donated money to the War Loan effort. 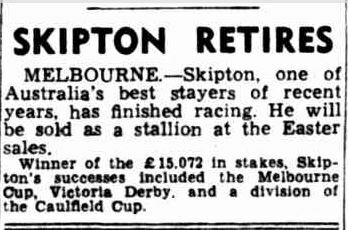 Once again, Skipton went into a Melbourne Cup with a chance to make history, as the first horse to win two Melbourne Cups and a Caulfield Cup. Also, only three other horses had won the Caulfield and Melbourne Cups in the same year. Coming around the back of the track before the horses entered the straight for the last time, it looked as though Skipton could win, sweeping around the field from a long way back as he made his run. However, as they entered the straight, he was forced wide and with a large weight, he could only manage a credible but well-beaten fifth, behind another favourite in the race Dark Felt. Skipton then ran in the Williamstown Cup later in November and ran second to Claudette. That was the last race for Skipton. He was brought into the stable in early 1944 for an Autumn preparation, with the Australian Cup in mind. Unfortunately, in early February, Skipton developed heat in his near side foreleg and trained at the beach for several days to take advantage of the salt water. However, it was soon realised the injury was serious and an announcement was made he would not run in the Australian Cup and later an announcement of his retirement. Just over a month later Myrtle Kitson sold Skipton at the Newmarket Sales. He fetched 1,500 guineas as a stud prospect, the buyer Kooba Stud near Scone, New South Wales. At some point, around the mid-1940s, the Kitsons left Hamilton and moved to Glen Iris, where Myrtle passed away on 19 September 1946. Myrtle left an estate of over £9,000. 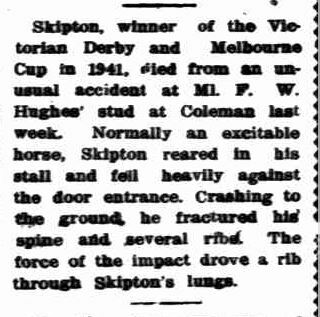 Late in December 1948, news came through the Skipton was dead aged ten, the result of a tragic stable accident. 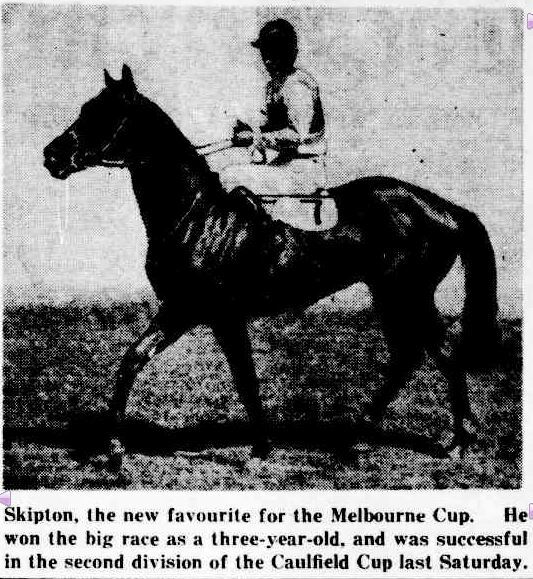 Underrated Skipton was the last horse to win the Melbourne Cup as a three-year-old and the last horse to win the Derby/Melbourne Cup, a record often forgotten. Trove Tuesday Goes to the Races! Today’s Melbourne Cup marks twenty years since a horse my father was a part-owner of, ran in the Cup. London Bridge won the Duke of Norfolk Handicap (now known as the Andrew Ramsden Stakes) in 1992, a race over 3200 metres at Flemington just like the Melbourne Cup, and he won it in race record time. His trainer was the Cups master, Bart Cummings, so London Bridge went into Melbourne Cup day with some hope of a good run. On Cup Day, the rains came and we knew from the Adelaide Cup in May 1992, that London Bridge was not partial to getting is feet wet. The winner of the Adelaide Cup was Subzero and when it rained at Flemington on the first Tuesday in November 1992, London Bridge’s chances decreased and Subzero’s chances increased dramatically. Subbie won and London Bridge ran a brave ninth. Both London Bridge and Subzero went on to noble careers after their racing retirements. London Bridge served as a police horse with the Victorian Police Force and Subzero was a Clerk of Course horse for 15 years and then became an Ambassador for Racing Victoria. At twenty-four, he still visits schools as part of Racing Victoria’s Community Education Programs and other public appearances. 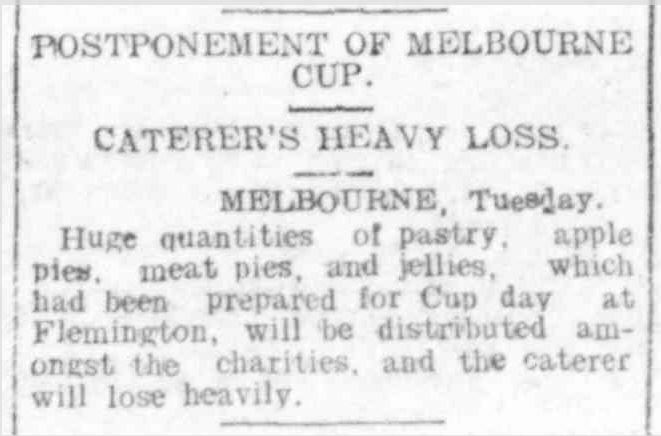 To mark the 20th anniversary of London Bridge’s Melbourne Cup run, this week’s Trove Tuesday has a Cup theme with newspaper articles about Bart Cummings. Both articles are from the Barrier Miner, a Broken Hill newspaper where, surprisingly enough, I find many treasures. The first article is from 1947 and a young Bart Cummings, working for his father, had a fall from a flighty colt. 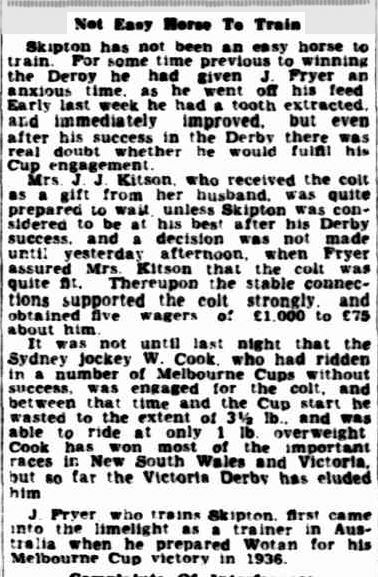 When I first read this story, I thought it was a different horse to that in the next article, 1950 Melbourne Cup winner, Comic Court. However after reading Racing Victoria’s bio of Comic Court I realised that Comedy Court and Comic Court were the same. Both horse and rider were lucky to win any Melbourne Cups! 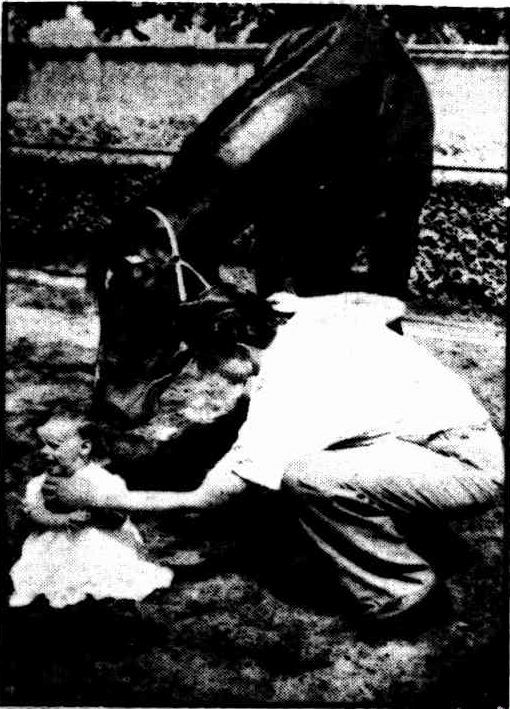 The next treasure from the Barrier Miner is a photo of Bart Cummings, Comic Court and Deidre Gath, the daughter of Albert Gath, a harness racing trainer, who had stables near Flemington. I like this photo as it brings together two racing dynasties, one thoroughbred racing, the other harness racing. I also love the way Comic Court is looking at Deidre. Three generations of the Cummings family became trainers, Jim, Bart and Anthony, while the Gath family had five brothers training during the 1950s. Like the Cummings name in thoroughbred racing, the Gaths are still a force in harness racing today. In August 2012, Andy Gath trained the winner of the Group 1 Breeders Crown Final with Caribbean Blaster and last Saturday, an Anthony Cummings trained horse, Fiveandahalfstar won the Group 1 Victoria Derby. 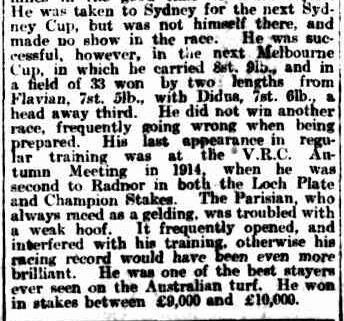 As John Finn Kirby led his 3yo colt from the Mount Gambier show ring in 1908 judged as Best 10 Stone Hack, most would not have considered the same horse would be led in as the winner of the Melbourne Cup three years later, almost to the day. But John Kirby had a dream, and his “10 Stone Hack”, The Parisian, was one of the several new horses he had purchased with the potential to complete the task. 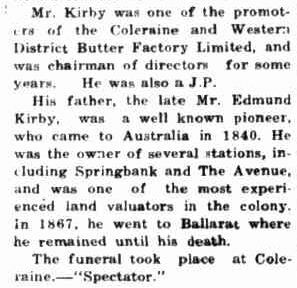 John Finn Kirby was born at his father’s Springbank station, near Casterton in 1858. His father, Edmund Kirby, was born in Northamptonshire and was one of the early settlers at Casterton as was John’s Irish-born mother Mary Finn. John and his sister Ellen each received their mother’s surname as their middle name. As was the way for the sons of the early pastoralists, John was sent away to school, Ballarat College the choice. 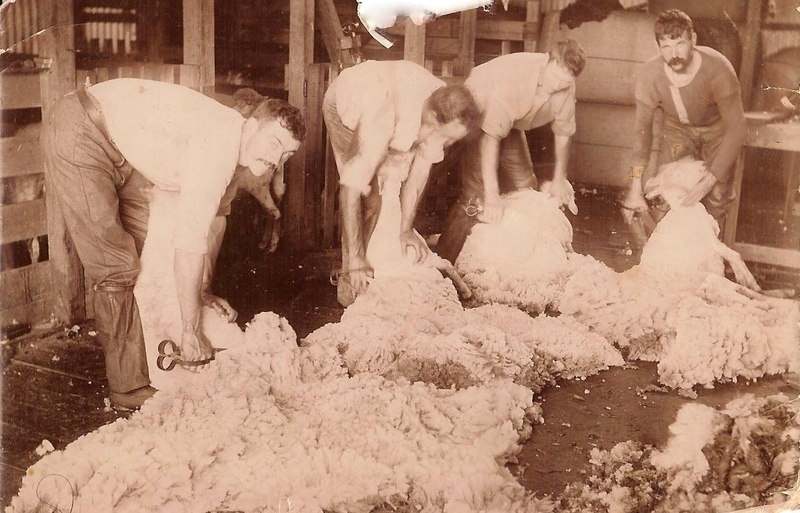 He then spent seven years working for stock and station agent in Ballarat. At age twenty-four, John went to work for Smallpage’s Stock and Station agents in Coleraine and after a year he bought the business. 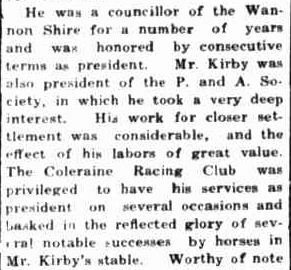 By 1883 he was secretary of the Coleraine Racing Club. 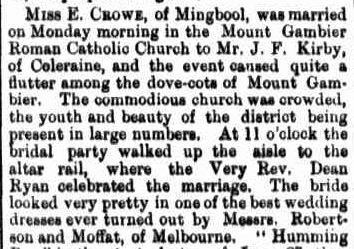 In June 1885, John married South Australian girl Elizabeth Crowe, daughter of the late Edmund Crowe and Johanna Crowe, owners of Mingbool Station near Mt Gambier. The wedding was a social highlight in the town creating much interest. 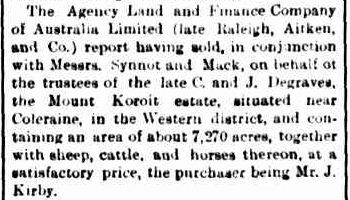 In 1888, John purchased Mt Koroite Estate near the Coleraine racecourse. In August 1889, Johanna Crowe passed away, resulting in an interesting battle over her will ending in the Adelaide Supreme Court. The estate, worth £80,000, was settled with embattled son John receiving £10000 and daughter Elizabeth, Mrs Kirby, receiving half of the balance. Her children received the other half of the estate. By the middle of 1908, John Kirby had acquired three promising young thoroughbreds, Halloween, Benderay and The Parisian. Benderay was the pick of the trio, brought by Kirby in Dublin, Ireland. 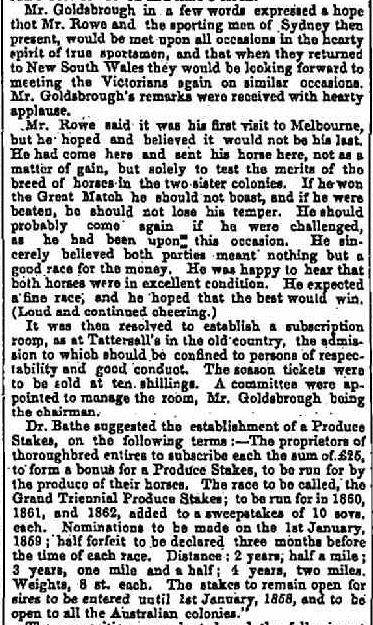 He eventually sold the out of form horse in 1912. 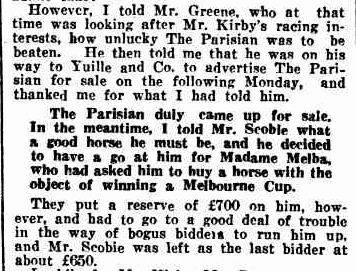 Halloween showed a little more promise and picked up a few races for Kirby, but he sold him at auction in 1911. 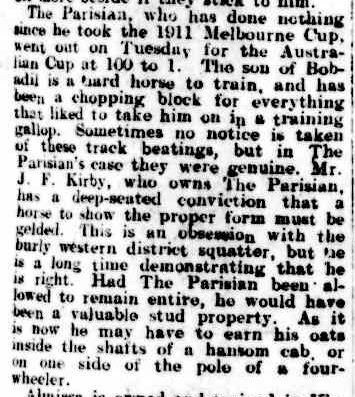 That left The Parisian, bought by Kirby in 1907 at the Melbourne Yearling Sales. 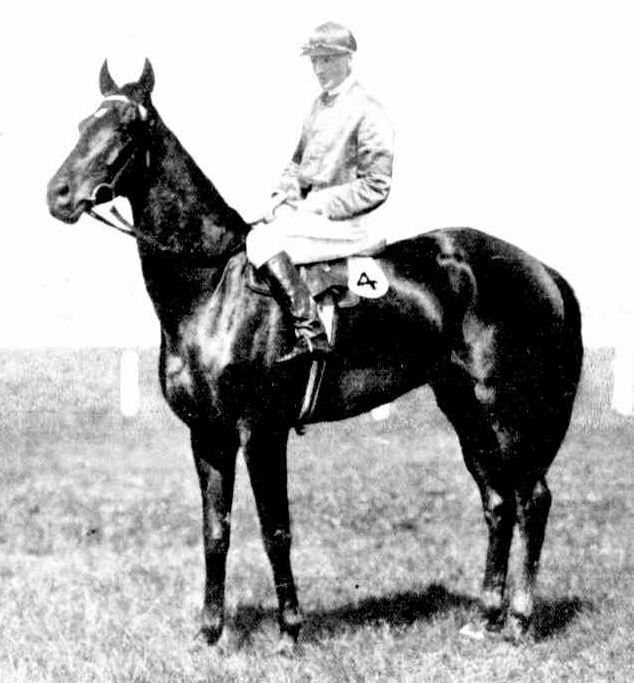 His sire was Bobadil, winner of the 1899 Australian Cup and Champion Stakes and his dam was The Parisienne. After his victory in the show ring in 1908, The Parisian was full work by January 1909 with trainer Ernie Hartwell. One of his early races, if not his first, was a six furlong Maiden Plate at Sandown Park on 7 April 1909, where he ran fourth, beaten by over ten lengths. 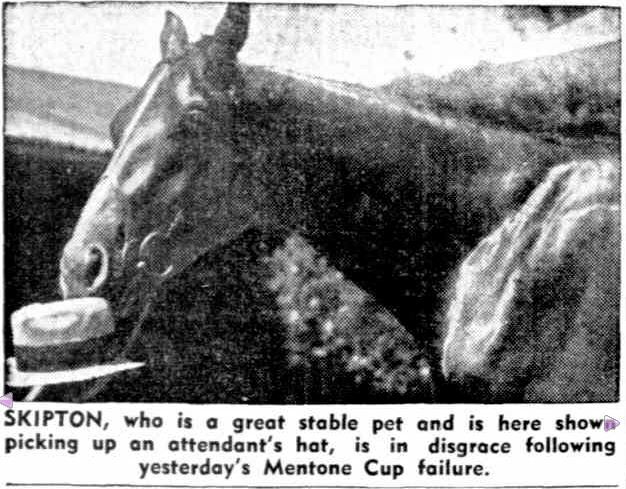 The Parisian scored his first victory on 19 April at the Mentone Races and he backed up an hour later to attempt a double. An undecided outcome in the second race led to a third race at the end of the meet. Despite his breeding, the horse was only raced over shorter distances with little success and he was put up for auction. The great Bobby Lewis, in later years, recalled that time. Passed in, The Parisian was sent to James Agnew, a Hamilton trainer, joining the stable on 1 January 1910. Agnew soon realised The Parisian was a stayer and increased his distances with success. 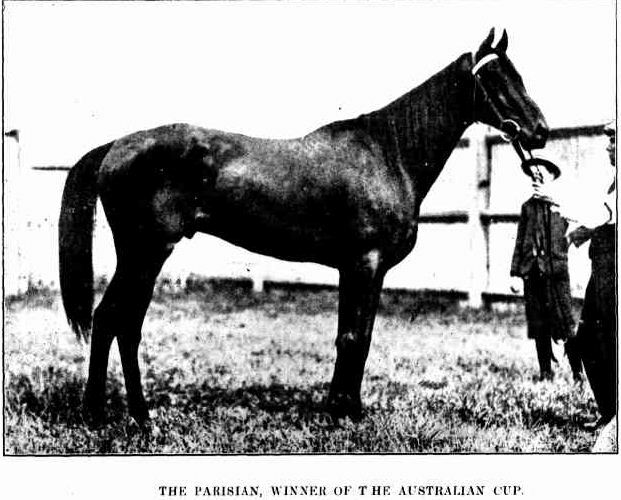 The Parisian won the 1910 Warrnambool and Hamilton Cups under Agnew. James Agnew’s wins with The Parisian were not enough for him to stay in his stables. 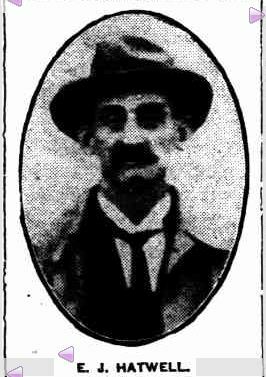 The Parisian, along with Halloween were leased to Charlie Wheeler of Caulfield in June 1910. 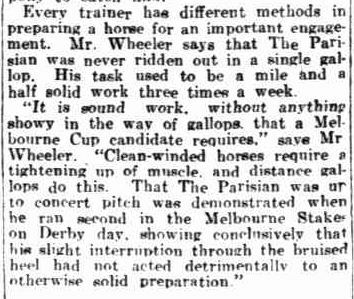 Wheeler took the lead of James Agnew and placed The Parisian over longer journeys and both he and Halloween were nominated for the 1910 Caulfield Cup and Melbourne Cup not long after their arrival in the Wheeler stable. On October 1, The Argus newspaper’s ongoing summary of the Cup candidates featured The Parisian. With only ordinary lead in form, it looked unlikely The Parisian would line up in the Caulfield Cup, with the Melbourne Cup a more likely option. It was also noted in his last race he struck himself and was given a few days off work. 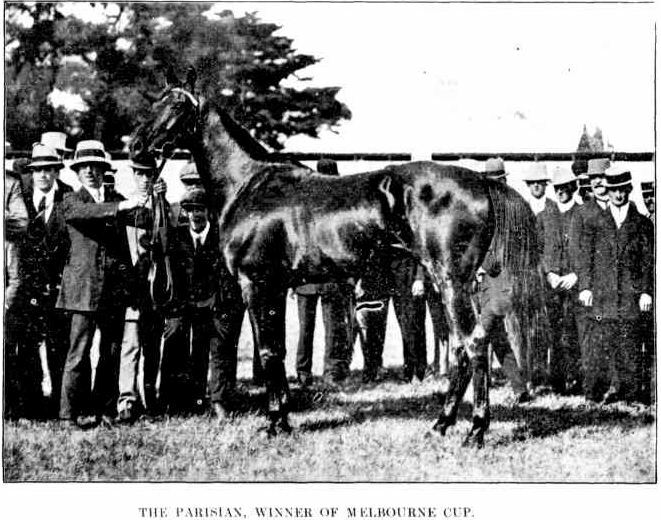 The Parisian did not recover fully from his injury of a cracked heel in time for the 1910 Melbourne Cup and he was scratched. 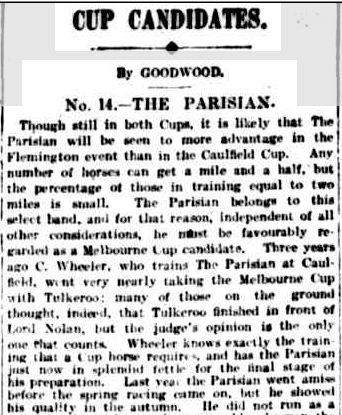 The Parisian’s first win of any note was the 1911 Australian Cup. The lead up to the race was eventful. Scheduled to run on 7 March, heavy rain leading up to the race saw the meeting postponed and rescheduled for 9 March, however, the rain did not let up and the race was again rescheduled for Saturday 11 March. Considered a weak field, there were only fourteen runners and The Parisian was sent out the second favourite. As the field turned into the Flemington straight The Parisian drew clear and won by six lengths, easing up. The Parisian then went off to the Sydney Cup, but he was not fully sound and struggled into twelfth. 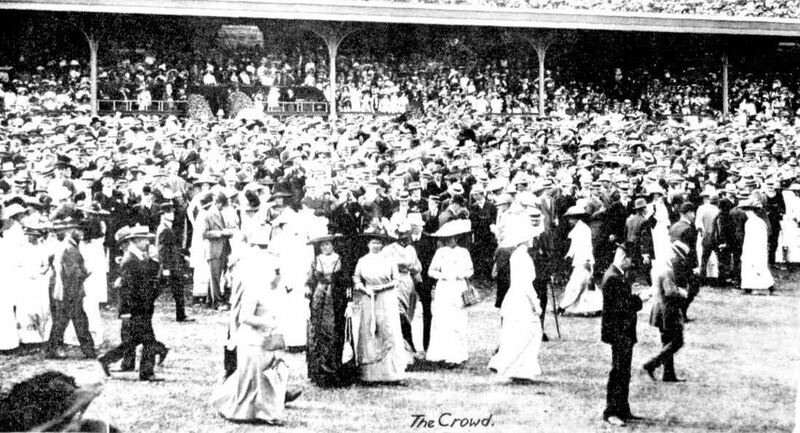 The next big race set for The Parisian was the 1911 Melbourne Cup. In the week leading up to the race, The Parisian again had heel problems and couldn’t put his hoof to the ground. Again it looked like he would be scratched. Charlie Wheeler put the horse in a small paddock full of capeweed next to the stables. The move paid off for Wheeler and on the morning of the race, The Parisian was galloping madly around his paddock trying to avoid capture. A record crowd of 115,000 people headed to Flemington for the 51st running of the Melbourne Cup. Trafalgar was favourite and The Parisian with Thomas Ronald Cameron aboard was second favourite in a strong field. The thirty-three horse field jumped and went fast early and as they passed the judge’s box for the first time, the field was well strung out. The Parisian began to make his move coming into the straight for the last time, but Cameron waited, not giving the horse his head until the very last. There was no doubt though as The Parisian overtook the leaders and won by two lengths although many thought it was more. The win was later described as “hollow” and “soft”. After weighing in, Thomas Cameron was mobbed by stable boys and other jockeys. Meanwhile out in the birdcage, John Finn Kirby’s dream had come true, he was the owner of a Melbourne Cup winner and his delight was clear. Reflecting twenty years later, Charlie Wheeler revealed the key to training The Parisian for the Cup. 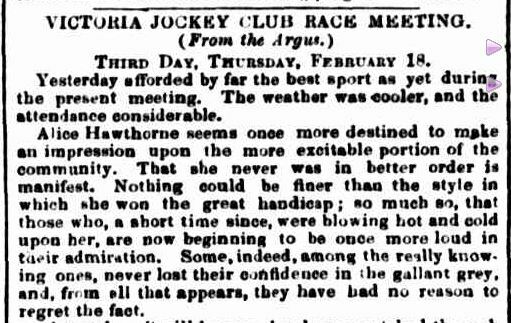 In the days after the Cup, The Parisian was sent to Bacchus Marsh for a spell while John Kirby collected his winnings on “Settling Day” at the Victorian Club. His winnings from the bookmakers were thought to be around £40,000. The stakes from the Cup another £7000, although Wheeler, as the lessee would have received the bulk of that. The Victorian Heritage Database notes around that time, Mt Koroite Homestead received extensive renovations and extensions presumably from Kirby’s winnings. He had a manager and many staff including a resident Chinese gardener and a chauffeur, Archie Gunning who drove Kirby’s car, one of the first cars in the district. 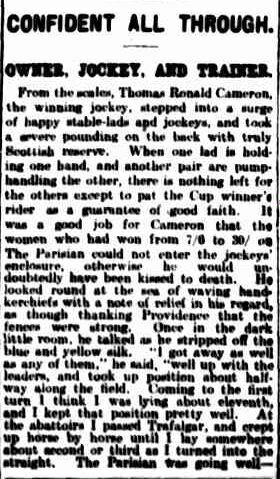 An Autumn 1912 preparation was on the agenda for The Parisian including a chance to repeat his win in the Australian Cup for which he was favourite. Unfortunately, his cracked heel again gave him trouble and he was sent to the paddock, missing all engagements. Brought back for the Spring Carnival, The Parisian ran in the Memsie Handicap first up but needed the run. He returned in the Rupertswood Handicap where he showed more but was tender after the race. During the following week, The Parisian pulled up lame after trackwork and a made to end his Spring campaign. 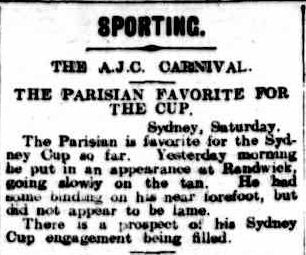 The Autumn Carnival of 1913 arrived and once again the Australian Cup was set down for The Parisian. Punters were wary given the ongoing query about the horse’s soundness. Their caution paid off when The Parisian’s cracked heel again saw him turned out. 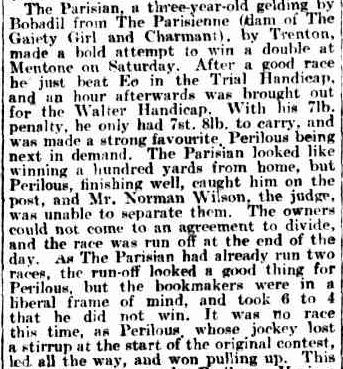 It would have seemed unlikely The Parisian would return for the 1913 Spring Carnival, but as a gelding, he did not have a stud career before him and he returned to the track again. Reports came in in early October he had gone amiss, however, he still ran in the Caulfield Cup on 18 October. There were rumours the horse had problems and a possible scratching, however, Charlie Wheeler insisted the horse was fine and ran him. The Parisian ran a creditable fourth but pulled up lame. Wheeler’s patience was wearing thin and he advised John Kirby the horse should be turned out for the rest of the Spring. 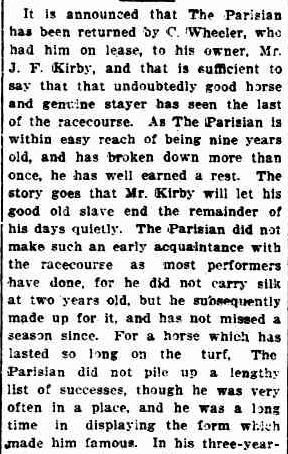 Eventually, in early November, Wheeler returned the horse to Kirby and The Parisian looked set to retire. 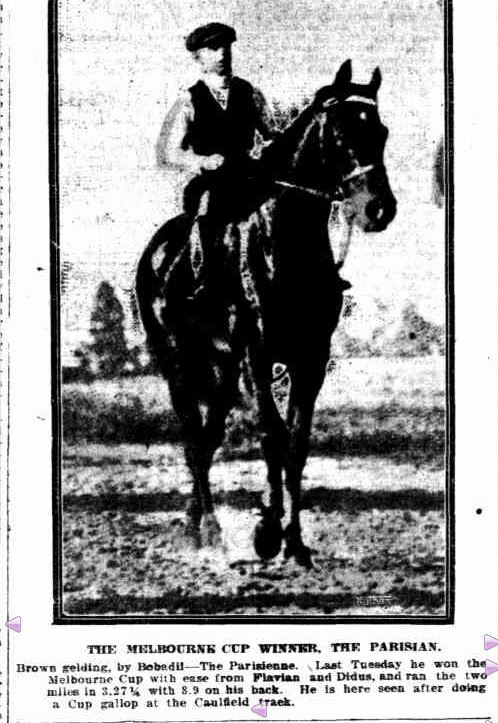 However, in January 1914 it was reported The Parisian would return to racing in the Western District but not before he raced in the Australian Cup in March. Plans changed again as Charlie Wheeler began an Autumn 1914 preparation with The Parisian. After a few starts, Wheeler finally gave up and once and for all returned The Parisian to Coleraine. At last, a retirement a Melbourne Cup winner deserves looked likely. 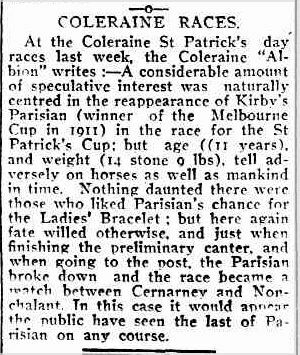 No word of The Parisian racing appeared in the racing pages until just under three years later. 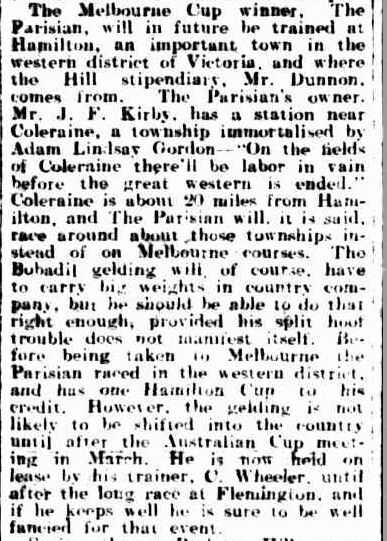 On St Patrick’s Day 1917, The Parisian returned to racing at the Coleraine Racecourse across from Kirby’s Mt Koroite Homestead. With a hefty weight of 14 stone 9 lbs, the heaviest ever carried at Coleraine, and ridden by, of all people, John Kirby’s chauffeur Archie Gunning, The Parisian broke down again. There was little doubt The Parisian had run his last race and around two months later, the sad news came The Parisian had been destroyed. Reports stated it was due to a start at a picnic meeting in the Western District. With no reports of the horse racing between March and May, it would have to be assumed his injuries were due to the unreasonable task he was given on St Patrick’s Day at Coleraine when his only purpose in racing, was to attract a crowd. This snippet from Broken Hill’s Barrier Miner four years before The Parisian’s death foresaw what was to come. After two unsuccessful preparations and three years presumably in the paddock, the horse seemingly needed to earn more oats. One would have thought as a Melbourne Cup winner he had earned more than a life time’s supply. A sad end for a brave horse. 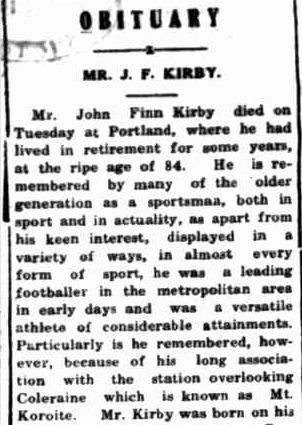 John Finn Kirby passed away at Portland on 7 April 1942 aged eighty-four. His wife Elizabeth had passed away twenty-one years earlier at the Kirby home “Koroite” in Kew, Melbourne. History shows The Parisian was the best horse Kirby owned, save for Napier a winner of the Great Eastern Steeplechase at Oakbank and the Grand Annual Steeplechase at Warrnambool. 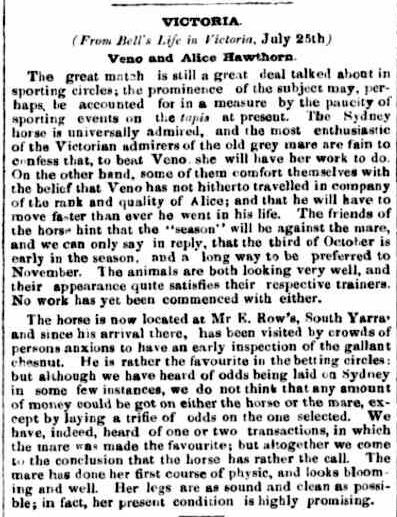 On 3 October 1857, a small grey mare known as “Alice” lined up for a match race with her rival Veno, from the colony of New South Wales (NSW), a race that would in time be remembered for its significance in setting the foundations for what has become Australia’s greatest horse race and strengthening the thoroughbred racing and breeding industry in Australia. It was a time when inter-colonial rivalry was high, but this period of racing’s history shows that the racing fraternities of each colony, while still highly competitive, were able to work together in a harmonious way to develop the industry we have today. 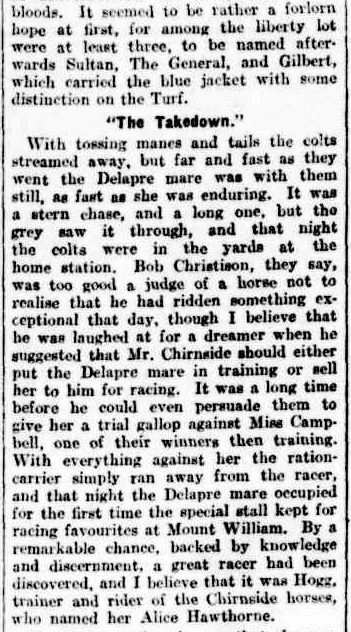 This story is not so much about the match race, rather the life of the grey mare and the mark she left on Australian racing history. 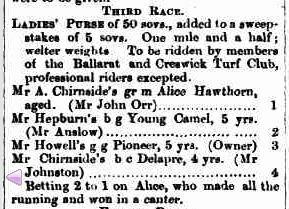 “Alice”, bred at Mt William Station in the Western District and owned by great racing supporters, the Chirnsides, was born sometime around 1849. Her sire was Delpare, an imported horse and her dam, Polly McQuinn, a part-Arab mare, bloodlines common in the early days of racing in Australia. “Alice” was branded with the Chirnside’s “key” brand. Horses bearing that brand could never be sold. At age three “Alice” was broken in and she spent time as a stock horse but, unlike her mother, she was not a good riding horse. The Chinese workers at the station used her to carry rations to workers situated at out stations on the property but she developed a fistula wither, a painful condition, and was turned out. During that time she became loose on the station roaming the bush for fifteen months. She ran with a wild horse and the result was a foal which died. Time in the bush had not served her well, but back on pasture, she blossomed. The little mare, who not long before had roamed the bush, impressed and ousted the talented Miss Campbell from her prime stall in the stables. She was also given her name, Alice Hawthorn. Her first race was at Hamilton over a mile and a half. “Alice” won, kicking off a remarkable career which would span the next four years. As was racing in those times, “Alice” returned to Hamilton the following day and backed up the win. It was not long before Alice Hawthorn was racing at Ballarat, Geelong and then Flemington. 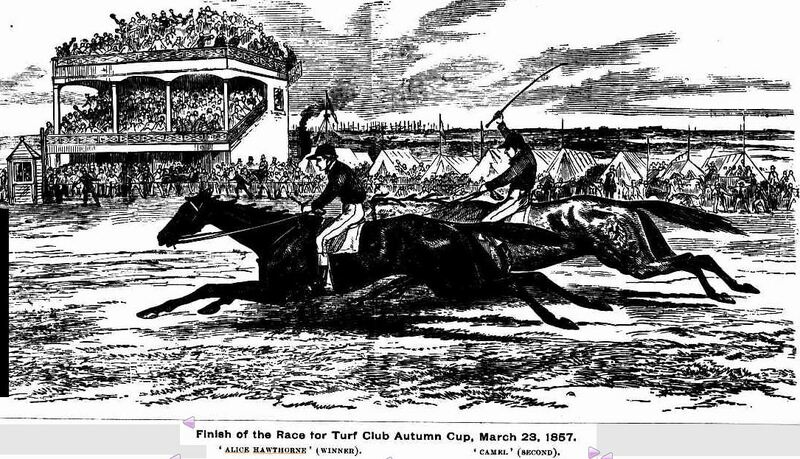 This sketch shows her storming down the outside to win the Turf Club Autumn Cup of 1857. 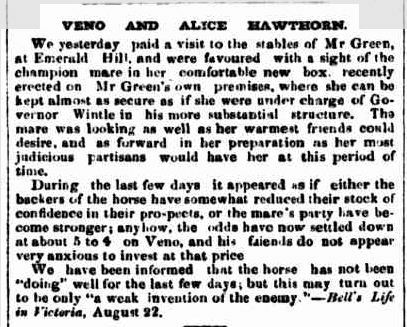 It was this race and others that saw Alice Hawthorn considered one of Victoria’s best horses and in turn, her name was given as a challenger to a horse from NSW in a match race of £1000 aside. 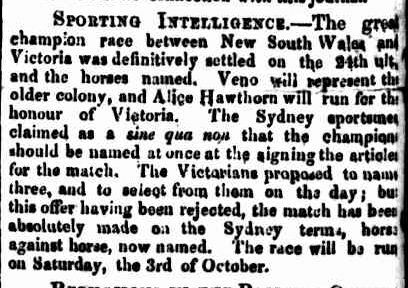 The Victorians wanted to nominate three horses and select the best on the day, however, this was rejected by their NSW. colleagues who nominated just one horse, the chestnut Veno. Alice Hawthorn, it was. There was some doubt in the minds of the Victorians that “Alice” was up to the task and her odds went out. Others considered the home track advantage would help her. Veno’s arrival in Melbourne created much interest with crowds of people gathering to see the Sydney horse. Meanwhile, there were security fears for “Alice’ and her trainer Mr Green built a stable at his home to accommodate her safely. This thorough description of “Alice”, including her physique, action and temperament is unlike anything seen today. The Melbourne correspondent noted her “fine, even temper which nothing can ruffle is the theme of universal admiration”. Jokes were often made about her arrival at the starting line for races, looking like she had just had a sleep. This probably helped her settle in her races and run out the three miles. Those attending the Great Inter-Colonial Match race from Sydney could take up the offer from the Australian Steam Navigation Company of a return ticket at a reduced rate. In the preceding days, something akin to the call of the card was held at the Tattersall’s Hotel in Russell Street, where the original challenge was offered. A healthy amount of money was wagered, all with a sense of good sportsmanship. Chair, Mr Goldsborough welcomed the sporting men of Sydney, including trainer Mr Rowe, and reassured them that they “would be met upon all occasions in the hearty spirit of true sportsmen”. At the gathering, a decision was made to set up a subscription room at the Tattersalls Hotel for those of “good respectability and conduct’ for a season ticket of ten shillings. The Produce Stakes was also devised, open to horses from all colonies. 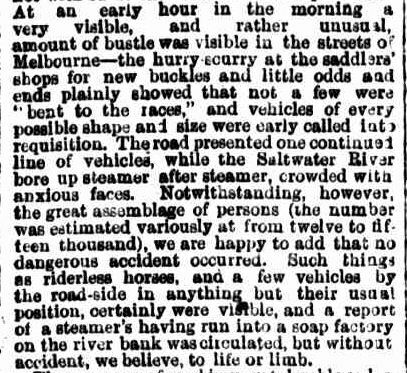 On the morning of 3 October 1857, all roads led to Flemington. For others, a steamer up the Saltwater River (Maribyrnong River) was the preferred transport. 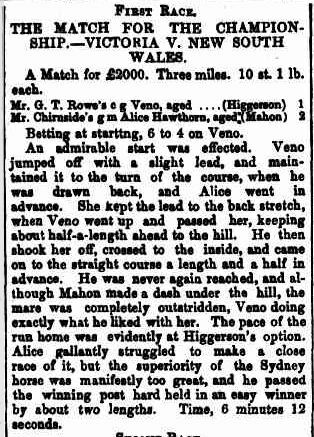 As feared by many Victorians, it was not Alice Hawthorn’s day, with Veno winning the three-mile race. “Alice” was not disgraced but could not match the stamina of Veno. Veno’s trainer accepted another challenge with the horse backing up two races later against Victorian Van Tromp. Veno raced another three miles, finishing in a faster time than his race against “Alice”, beating Van Tromp by two lengths. 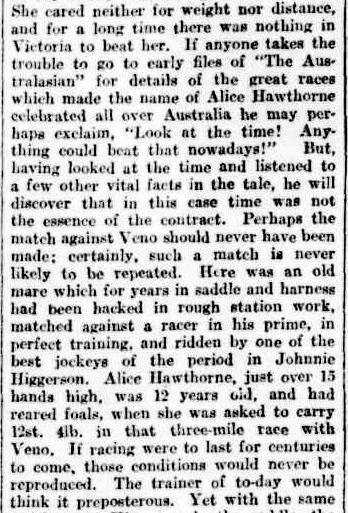 The Victorian racing fraternity was left questioning their horses’ bloodlines and those from the colony of NSW left no doubt where Veno hailed from as this headline from the Empire, a Sydney newspaper shows. 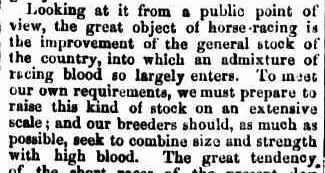 This article from The Argus, written in the days, stressed how important breeding better Victorian horses was if they were to match it with the other colonies and the need for good horse races such as the match race, to make sure that the standard of horse improved. It was not long before “Alice” was back racing and on 2 December she was at Ballarat, once again a winner. 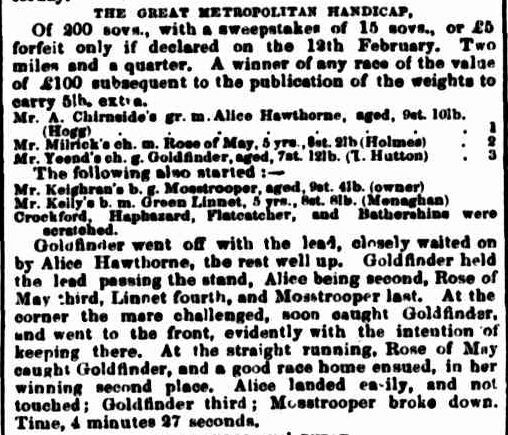 On Thursday 18 February 1858, Alice Hawthorn won the Great Metropolitan Handicap at Flemington, redeeming herself with those who dismissed her both before and after her match race with Veno. “Alice” continued to race and win. Just over twelve months after her match race, she was still considered Victoria’s leading three miler, although some thought this was because she had nothing to beat. 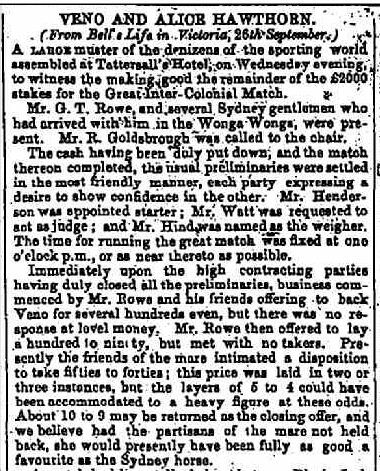 The 1 October 1859 was the first running of the Australian Champion Sweepstakes at Flemington racecourse. 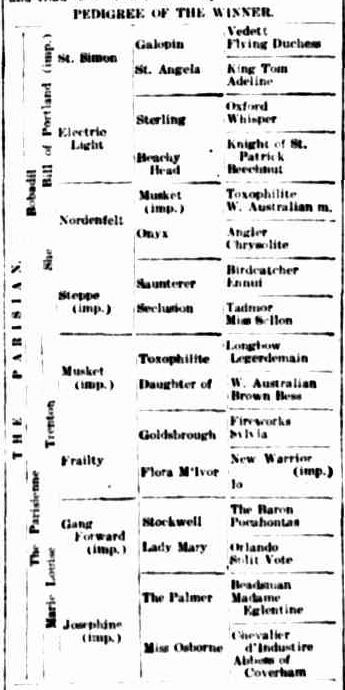 Horses from the colonies of South Australia, New South Wales and Tasmania were among the entries, true inter-colonial racing. One of the entries, The Barber from South Australia, had an unfortunate and unexpected link to the Western District. The Barber’s transportation to Melbourne was the steamer Admella. The Admella struck trouble along the South Australian coast near the Victorian border and the Portland lifeboat Ladybird with Captain James Fawthrop at her helm went to the rescue. All the horses aboard the steamer drowned, except for The Barber, who amazingly came to shore, two and a half miles away from the wreck. He was then walked overland to Geelong and travelled by rail to Melbourne. Not surprisingly he finished close to the tail of the field in the Sweepstakes. 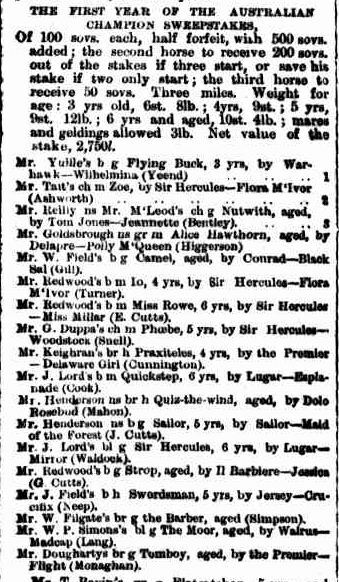 “Alice”, by this time at least ten years old, acquitted herself well in the three-mile race running fourth behind the winner Victorian Flying Buck, a three-year-old. 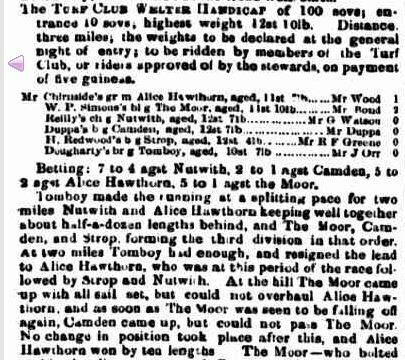 Alice Hawthorn ran her last race in November 1859 in the Turf Club Welter Handicap over three miles. She won by ten lengths and retired with £5000 in stakes money, the highest of any horse in the colonies. The Chirnsides sent their mare to stud for a meeting with their imported stallion Peeping Tom. It is not clear if the mating was successful. 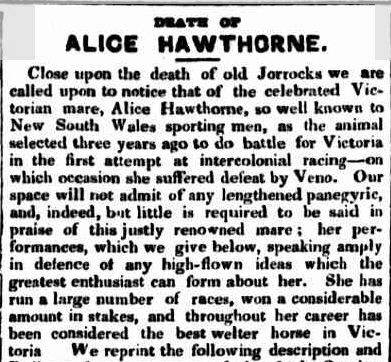 On 12 August 1860, the mare they called “Alice” passed away at the Chirnside’s Point Cook at twelve years of age, only nine months out of racing. Her lungs that gave her the stamina to run long distances had failed her. “Alice” went from the foothills of the Grampians to matching it with some of the leading horses in Victoria and the other colonies. She easily could have remained at Mount William Station as nurse maid to the future stars of the Chirnside’s stables. It was only for her demonstration of brilliance rounding up the escaped horses that saw her rise to becoming a household name. She saw hard racing considering many of her races were over three miles, a mile further than the Melbourne Cup. 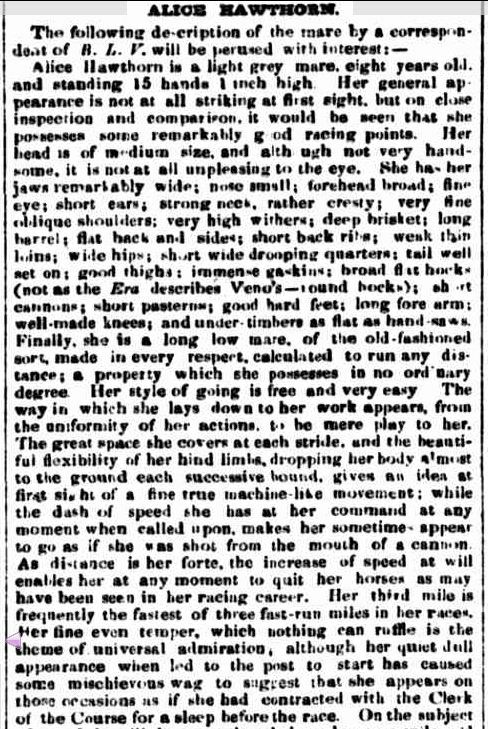 Horses from her time could run two three mile races in a day, just as Veno did on 3 October 1857. 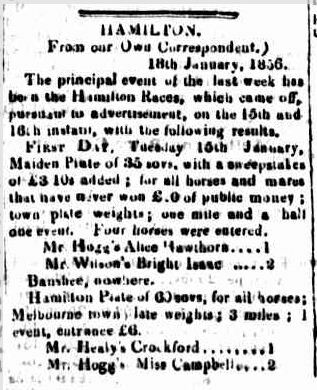 In 1861, the first Melbourne Cup was run. Racing was building up to a race like the Cup from the time of the Great Inter-Colonial match race, the Great Metropolitan Handicap and the Sweepstakes, but unlike those races, it has endured and strengthened over 150 years. Racing was evolving, as it was suggested it should after the 1857 match race, by creating great horse races to improve the stock. Unfortunately for Victoria, Archer from N.S.W. won the first two cups. 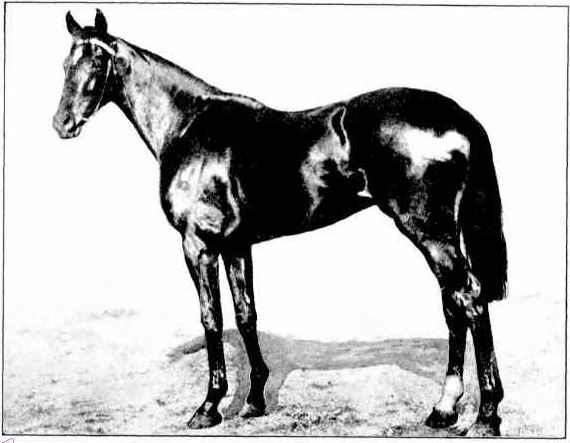 Banker, bred by Woodend hotel keeper Joseph Harper, finally won for the colony in 1863. 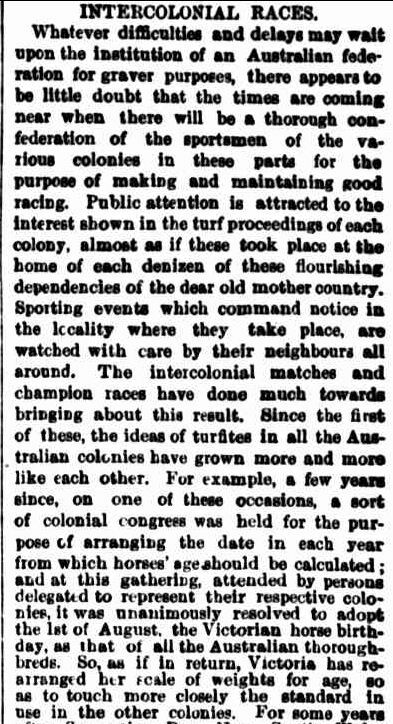 The Great Inter-Colonial match race began the stream of horses across the borders to race in Victoria. Today, Victorian racing is International, with overseas horses not only racing here in the spring but taking the main prize. 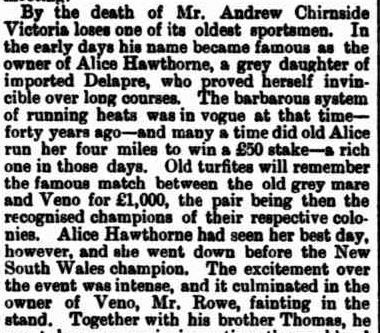 At the time of the death of Andrew Chirnside, The Border Watch reported that Alice Hawthorn helped make his name in racing circles. I came to know about Alice Hawthorn while searching for articles about Mt. William Station at Trove. My ggg grandfather James Mortimer and his family arrived at Mt William Station around 1853, about the time “Alice” was broken in. He was there when she was working as a packhorse and when she rounded up the young horses. When Cuthbert Fetherstonhaugh was at Munthum Station and heard the stories of the Delpare mare, James Mortimer was at Mt William Station. Was James Mortimer one of the stockmen who rode Alice her and dismissed her as a riding horse? He must have at least heard talk of her. The talk of her continued for years after. 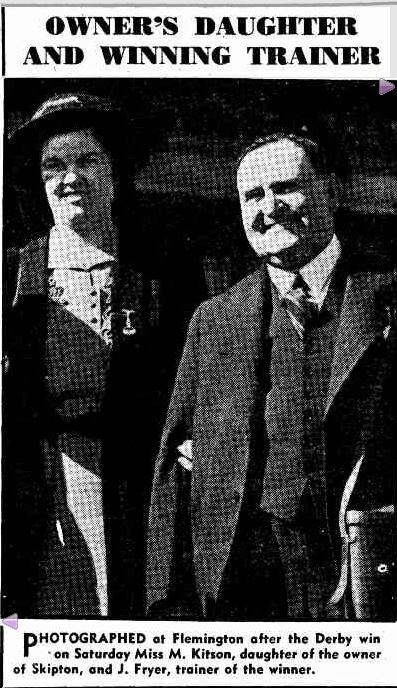 Donald McDonald, in 1928, put Alice Hawthorn’s racing career into perspective.